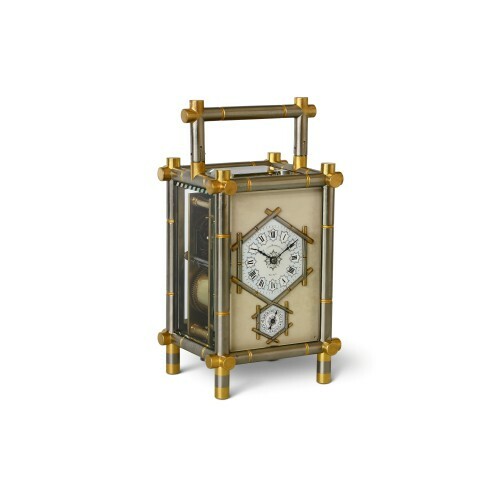 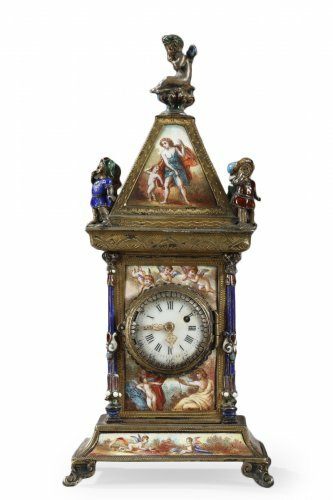 Large-scale, torsion pendulum mystery clock, signed J. Pratt, Comptoir General, Paris, circa 1890. 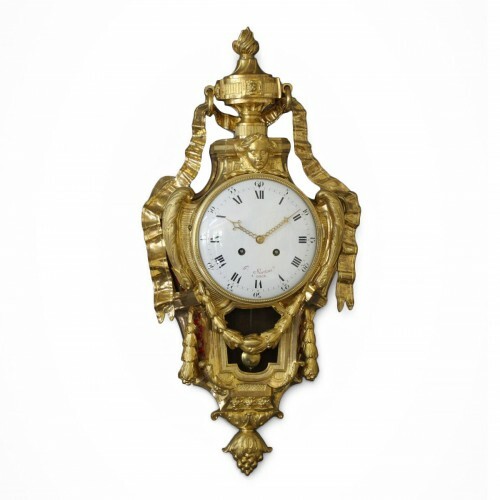 Large Paris-type movement with Brocot half-rollers escapement of exceptional size interacting with a 9-teeth escape wheel (!) 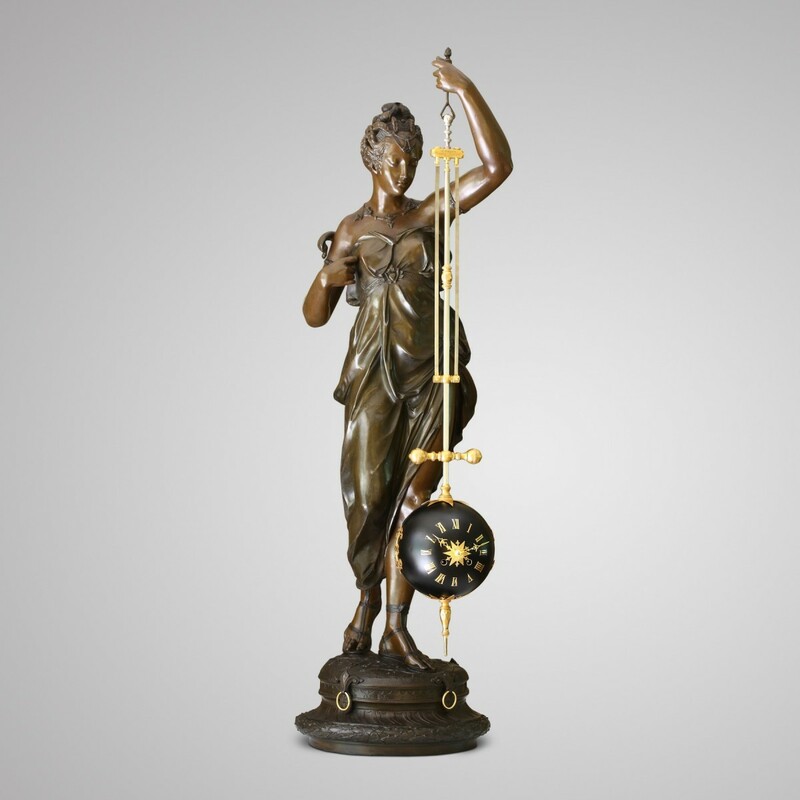 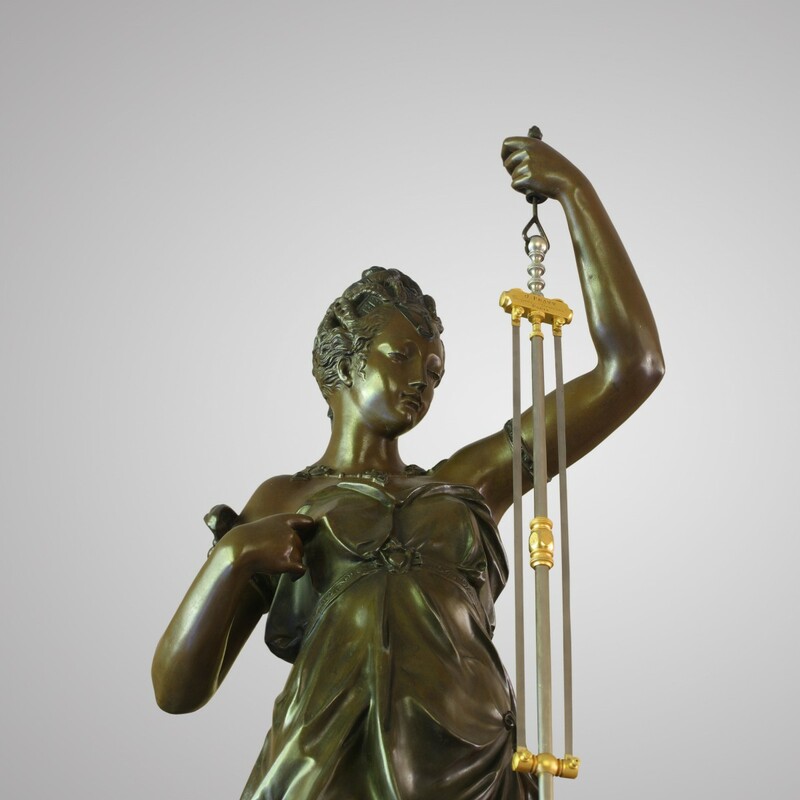 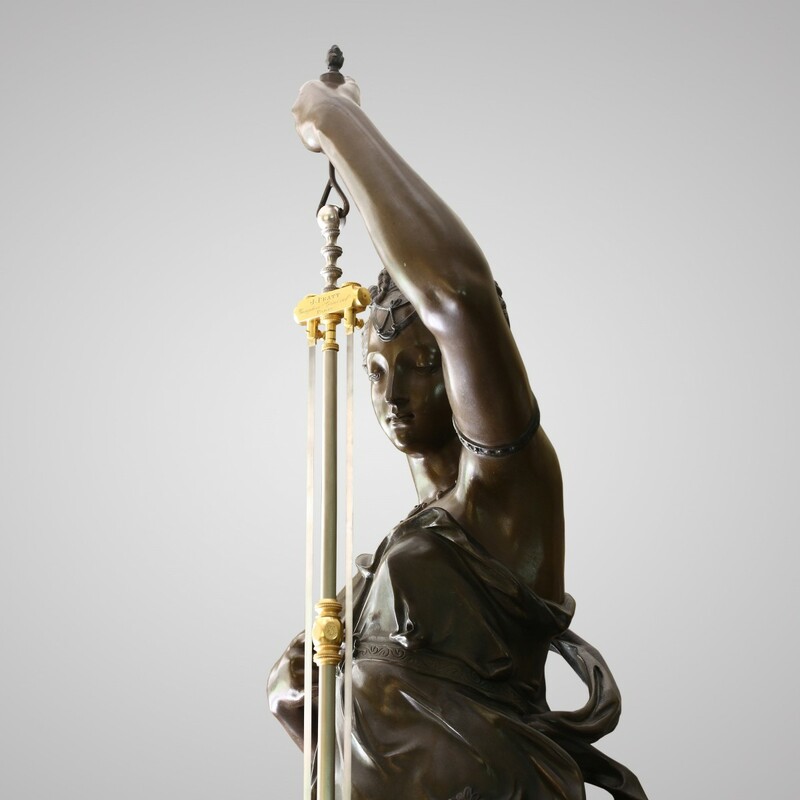 The swing from left to right is through a thin rod placed inside the larger vertical nickel-plated rod suspended by the arm of the statue. 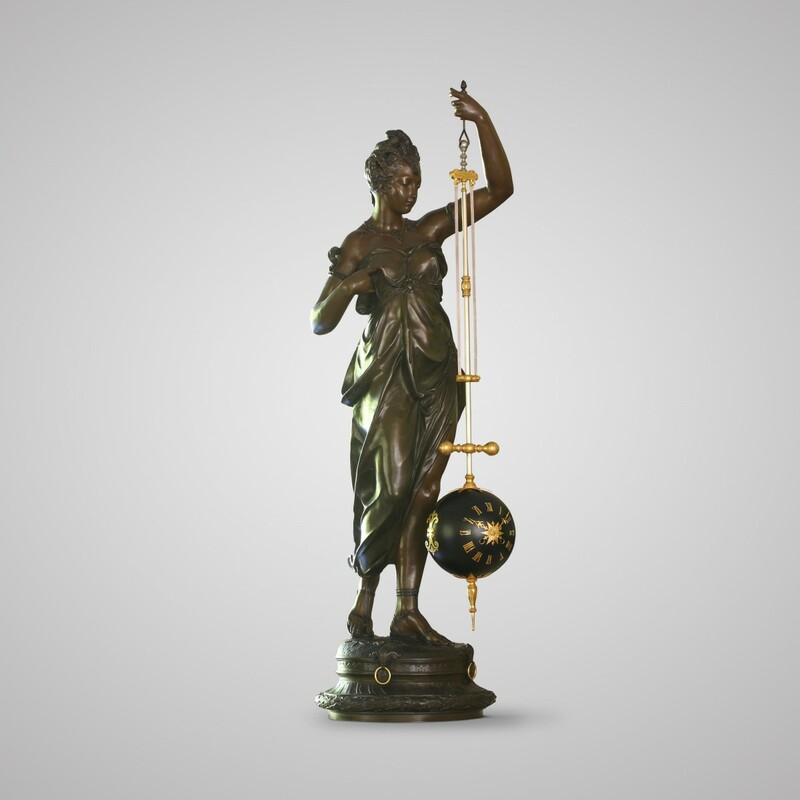 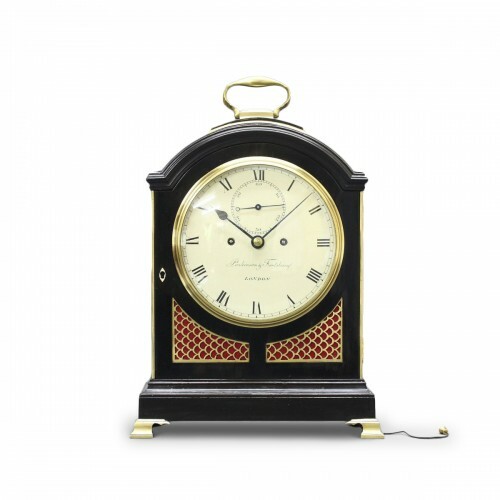 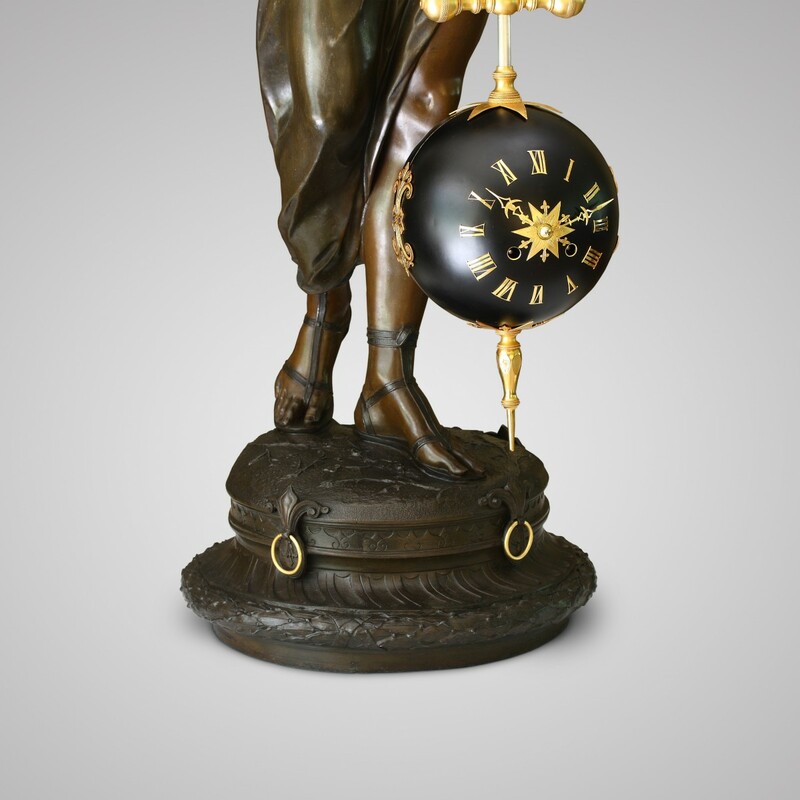 The black painted sphere-shaped dial is hollow and contains the clock’s movement. The whole swings from left to right at about a 30° angle, the assembly hanging through two long and thin suspension blades. 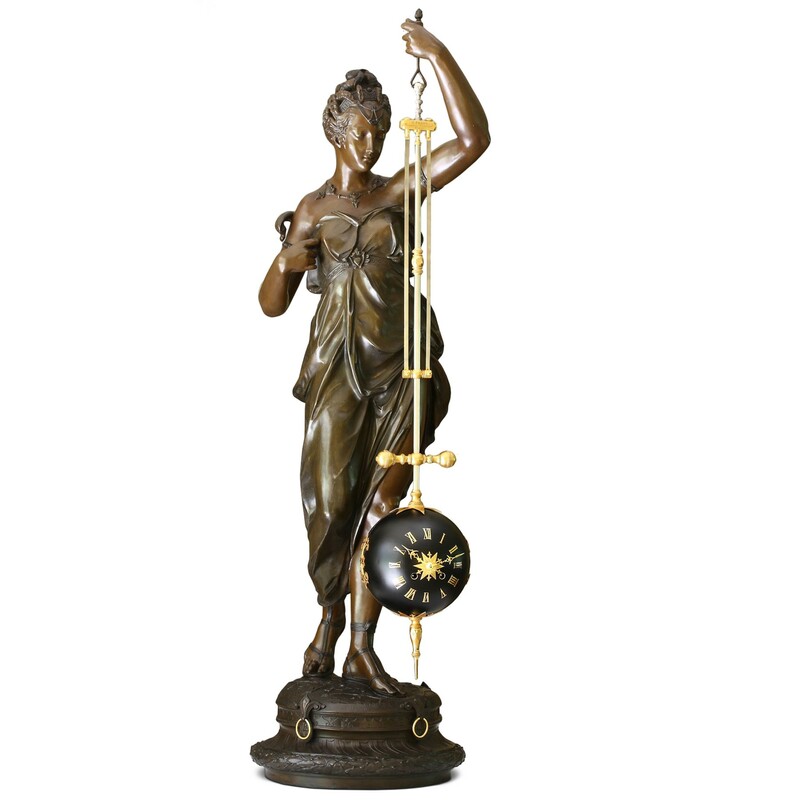 Countwheel strike every half-hour on a silvered bell. 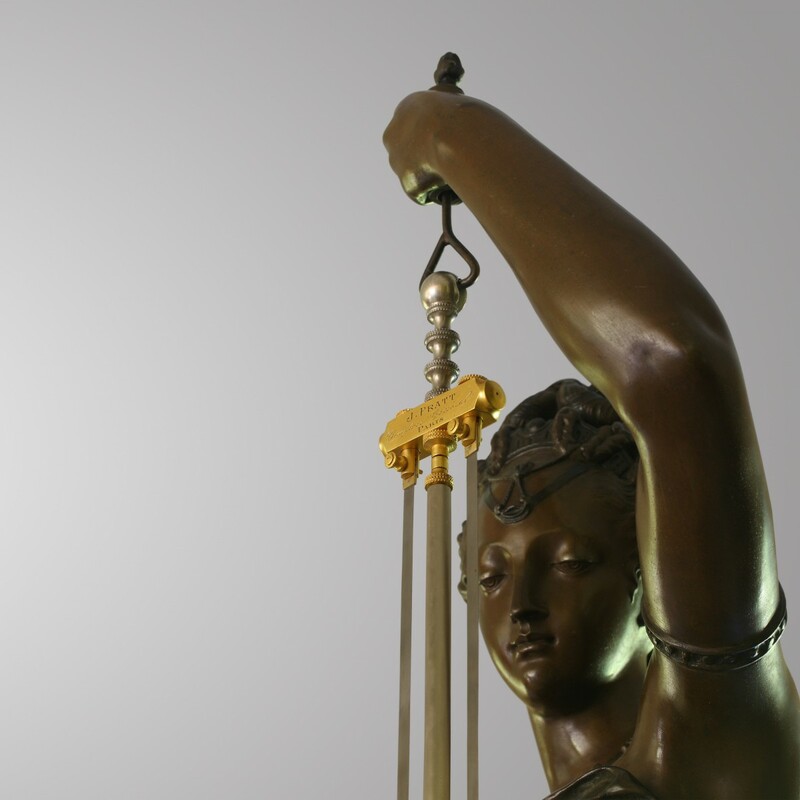 Autonomy 8 days. 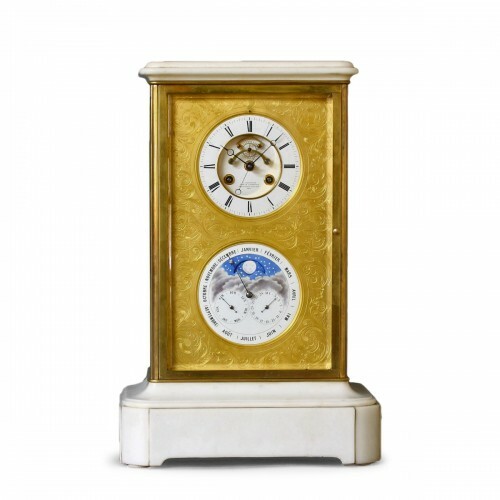 The dial has twelve applied chased gilt-brass Roman hour numerals surrounding a central star and two finely chased gilt-brass half-moon hands. 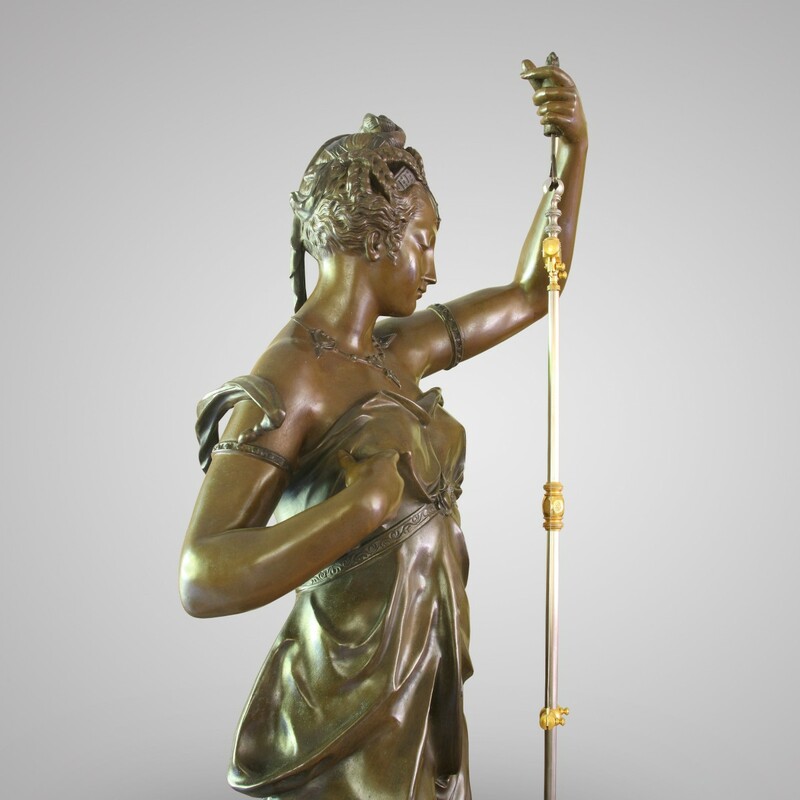 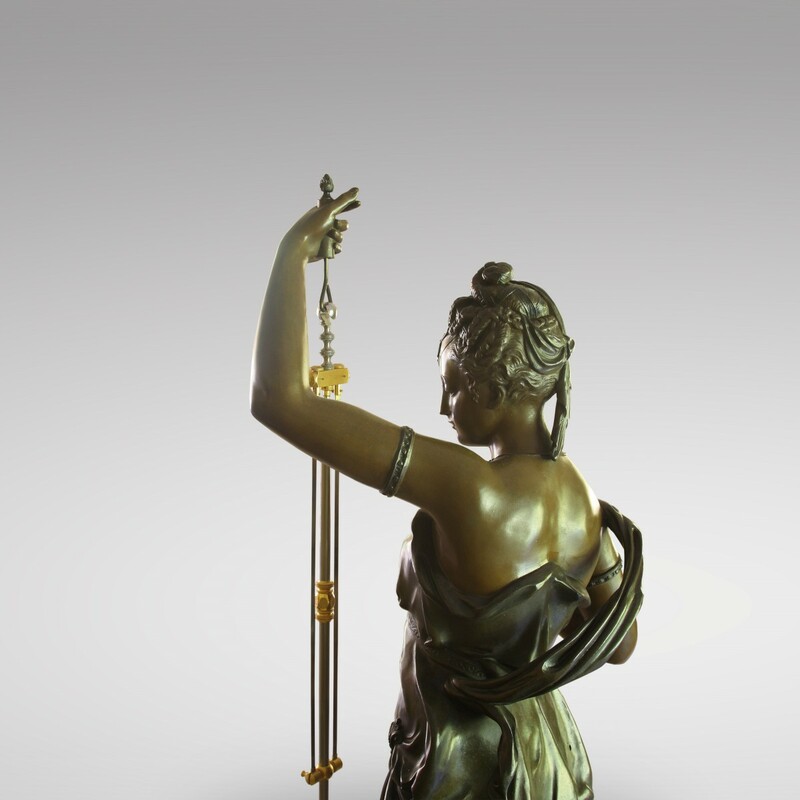 The two-tone patinated spelter support, in the form of a draped female figure inspired from celebrated Italian Renaissance models; the sculpture in contrapposto, brings movement and lightness to the composition. 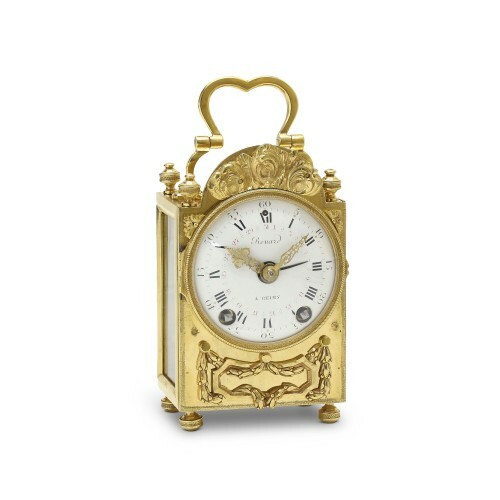 The dial, gracefully suspended from the figure’s hand at the end of a long embellished shaft, terminates in a fine point. 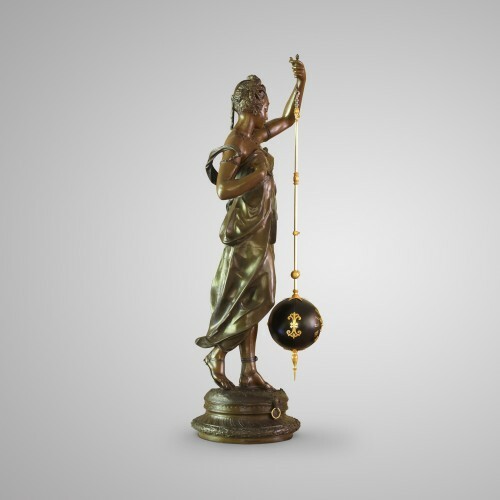 The latter highlights the impression of mystery emanating from the sphere, which moves around itself instead of swinging to-and-fro: the figure’s hand remains stationary and, yet, the sphere continues to move with no obvious impulse to keep it going! 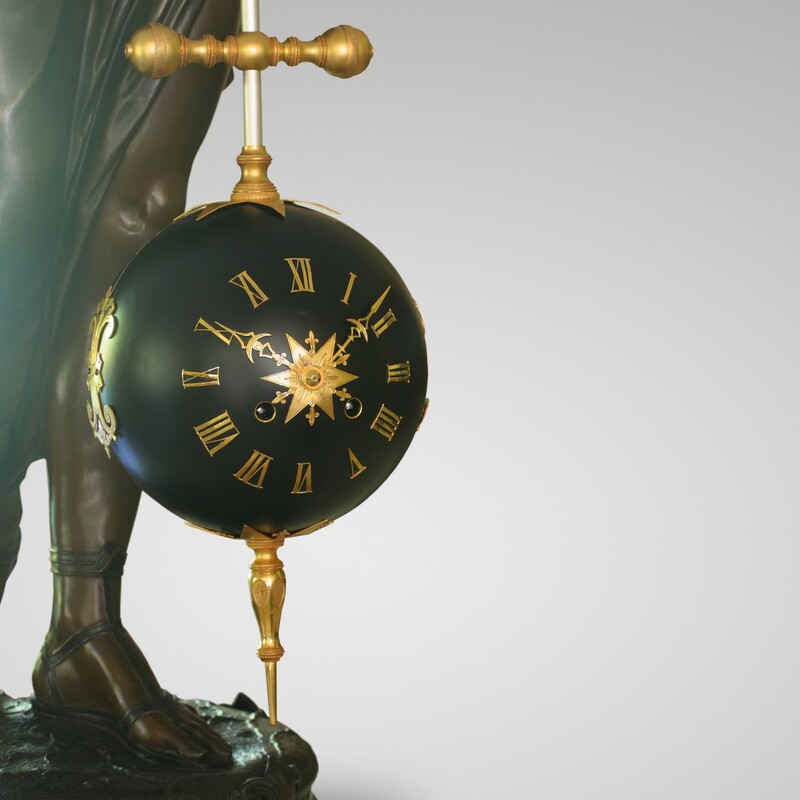 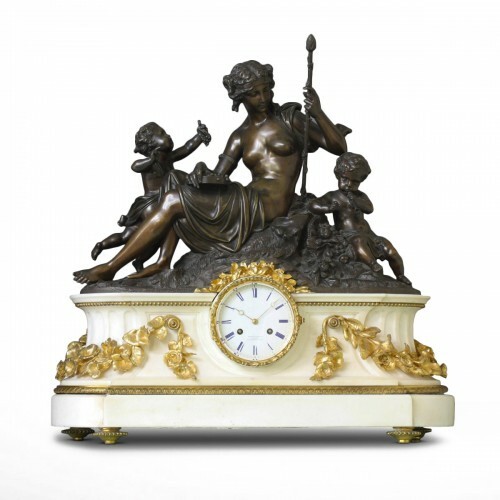 Genuine tours de force and triumphs of ingenuity, mystery clocks are designed to hide their workings, creating the kind of illusion we see here: a contrast between the figure’s perceived movement and the sphere’s static horological precision.